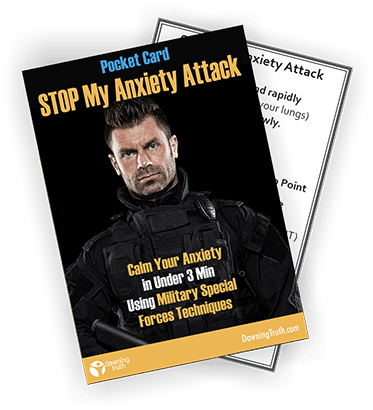 Carry this Card in your Pocket to Stop your Anxiety Attack in its Tracks - No Matter Where You Are. Calm your anxiety in under 3 minutes with cutting edge techniques, used by Military Special Forces. Stop limiting your life due to the fear of an unexpected panic attack. The 2 Word Technique used by military special forces to stop panic during combat. When I was younger I used to be overwhelmed by fear. I did not even realise I was getting Panic Attacks. I spent many years trying to find the best way to deal with these attacks. Eventually my research led me to the study of military techniques for dealing with combat anxiety. Turns out that ​military personnel suffer from intense anxiety and panic attacks in the midst of battle. The military has developed techniques for dealing with this. This card outlines those techniques as well as techniques from the Ninpo (Ninja) and cutting edge Energy Psychology. These techniques ​allowed me to stop my panic attacks in their tracks, in less than 3 min. The best anxiety attack stopping techniques in existence on a single card you can carry with you anywhere. Their effectiveness still amazes me. Free from the worry of unexpected panic attacks.